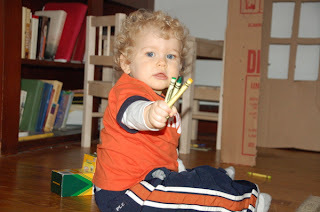 i decided to get owen his first set of crayons. so of course i then had to get him a table to sit at while he colored (see in the background). and you cant color without paper. well... actually you can color on the table, blue shows up the best on a light wood surface, as does red, or any shade of either. instead of just getting owen the 8 big jumbo made for toddler hands crayons... i decide to invest in the box of 48 regular sized ones. mistake. coloring now resembles pitching practice and how fast one can clear 48 crayons off a table. at least he's having fun!